A colorful door is an easy way to jazz up the outside of your home. We actually painted the Outfitter’s Cottage doors coral to add a pop of color to the gray siding….kind of bold, but it works. And if you find that you were overly ambitious, it’s nothing that a can of paint can’t take care of. Some door colors can be an outward expression your home’s personality, and the people who live in it, but others have a deep rooted meaning. Let’s take for example the tried and true, red front door. In early America, families would paint their doors red to let others know their home was a welcoming place of rest for weary travelers. While this tradition in America has been long gone, Scotland actually still uses the red door for their own symbolic meaning. The Scots paint their doors red to signify that they have paid off their mortgage. 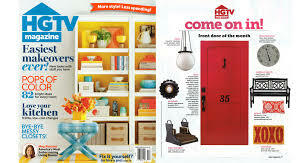 For some interesting and festive color ideas, check out the first few pages of HGTV magazine….yes, I’m slightly addicted. Remove all hardware – Trust me, you don’t want to deal with all the chemicals it takes to remove paint from hardware. Cover any glass with painters tape. Clean it! – Wash that door with a wet sponge, otherwise your paint won’t adhere correctly. Sand it – Lightly sand away any raised areas or old paint bubbles, this will ensure your paint goes on smoothly. Prime it – As with any paint job, you want to make sure you have a good base to keep your paint bright and long lasting. Paint it! – Now’s the fun part, Paint with the grain of the wood, and use a foam brush to get into the sides of those tricky panels. We’re looking for color ideas for the next 2 Outfitter’s Cottages we’re getting ready to build. So if anyone has any creative suggestions, we’d love to hear them!